Is it Destoroyah, Destroyah, Desutoroia, or Destroyer? 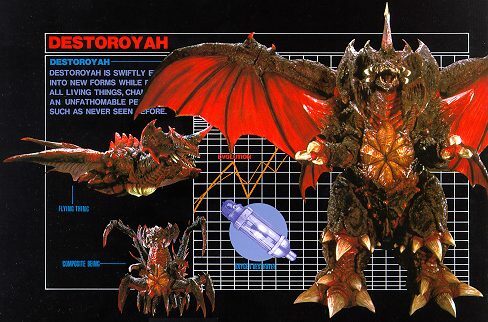 Toho deliberately spelled the name of the monster in English as "Destoroyah" for the simple reason that they couldn't copyright the common name "Destroyer". The actual Japanese characters are something like "Destroia", but Toho bungled the English transliteration. Since the monster was named for the Oxygen Destroyer, I tend to believe "Destroyer" should've been his proper English name and left it above in honor of my preference. Go Back to the Title Page.